Often it takes a change in environment for one to fully embrace the opportunities that exist on your home turf. For Maria Marco, assistant professor in the Department of Food Science & Technology at the University of California in Davis, spending six years in the Netherlands was her turning point. 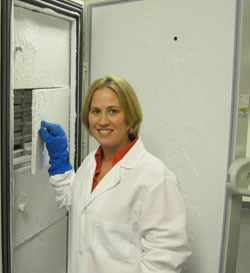 When Dr. Marco returned to the States after working as a postdoc and project leader on gut microbiology research at Wageningen University, NIZO food research and the TI Food & Nutrition Institute, she was ready to assist with making the U.S. dairy industry a global leader in terms of research and application. Her time abroad fueled her decision to return to California, where she had received her Ph.D. in microbiology from the University of California in Berkeley in 2002. She recognized the opportunity to use her knowledge in microbiology to help advance the U.S. food industry. “My experience in the Netherlands was very transformative,” she says. “As a culture, the Dutch are very forward thinking. They are especially aggressive in studying the science of food and dairy and making their findings applicable to the manufacturing industry. “I found it amazing that at this point in time we don’t know all there is to know about milk and products made from milk. We are just starting to scratch the surface,” says Dr. Marco. “The deeper we dig, the more we find out.” And digging is what she and her team do at UC Davis, where she opened a laboratory in 2008 to study the molecular genetics, ecology and host-microbe interactions of lactic acid bacteria in food systems and the mammalian digestive tract. Dr. Marco received her bachelor of science in microbiology from The Pennsylvania State University in 1995, and then decided to pursue her advanced degree at Berkeley. Here she met her future Dutch husband. Wanting a change of pace after graduation, they moved to The Netherlands. This decision was one that would impact the direction of her career as a microbiologist. Food science, with a strong emphasis on dairy, is a very prominent discipline at Wageningen, in fact they refer to that area of the Netherlands as Food Valley. It is here where she became enamored with food science. “For some time I had had a fascination with the practical application and significance of microorganisms. I don’t think there could have been a better match between my innate curiosity for microbiology and dairy research.” It is this spirit that she brought back with her to California. So what is going on behind the doors of Room 3221 in the Robert Mondavi Institute at UC Davis? The broad objective of Dr. Marco’s lab is to understand the roles of food-associated bacteria in food processing, food safety and human health. Organisms of particular interest are lactic acid bacteria found in dairy, plant and gut environments. Those bacteria are important for the production of fermented food products and specific strains are currently being applied as probiotics to deliver health benefits in the human gut. For example, her lab is funded by the U.S. Dairy Research Institute to investigate the inherent value of dairy as the food of choice for delivering probiotic Lactobacillus for health benefits. Milk is also of particular interest because of the bioactive and microbial components in dairy products and their potential impact on human health. She feels this is particularly important in California, which has a long history of dairy research. And she believes UC Davis is the ideal setting for her research, as it was recently ranked number-one for agricultural research internationally. The California Dairy Research Foundation (CDRF) is funding a two-year project with Dr. Marco to develop high-throughput DNA sequence-based methods for identifying and quantifying the total and viable bacteria in milk, dairy processing streams and dairy products. This project, entitled “Bacterial Signatures of Milk Quality” is needed because it brings state-of-the-art methods to the dairy industry and will support the industry’s efforts to provide milk and dairy products of the highest quality and safety to the consumer. This project will have a variety of short- and long-term benefits, including publications in top peer-reviewed journals, training of the next generation of scientists to work in the dairy industry and new rapid methods that can be directly applied by the dairy industry to enhance their daily operations. Dr. Marco will be working directly with dairy processors in California to develop the project in a manner that builds bridges, effectively linking research to application. “CDRF recognizes that it is crucial for the dairy industry to better understand and control the microorganisms in milk and dairy foods in order to continue to provide only the highest quality products to U.S. consumers,” says Dr. Gonca Pasin, Executive Director of CDRF. “This is not an off-the-shelf technology, but a next-generation method. I am certain that DNA-based methods are likely to become standard tools for monitoring food quality. This profile was written by Donna Berry, a food scientist and editor in the dairy and food industries. She will contribute monthly “Check Off Dollars in Action” columns to the CDRF website, which will highlight CDRF-supported research efforts and programs and the innovative individuals behind them. To contact her, visit www.BerryOnDairy.com.